What Is Tom Waits Up To? 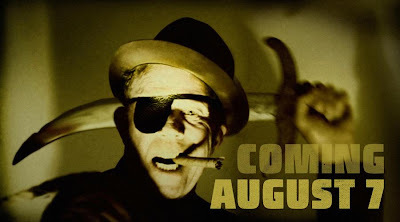 The first thought that comes to mind is that Tom Waits needs to be a pirate. Soon. In a movie. In a song. Something. The second thought is…WHAT DOES IT MEAN??? Waits recently appeared on the Letterman and Fallon late night shows on consecutive evenings. Which seemed like an odd move at the time, given that his last album, “Bad As Me” had come out nearly a year prior to the appearances. Apparently they were an initial effort to raise awareness/interest in one Thomas Alan Waits. There is no new album release scheduled for August 7th, and even if there were, there would surely be more of a promotional campaign than this. Clearly, Waits will announce something…but what? A tour? That’s my vote, but most fans say it’s unlikely, given his aversion to touring in recent years. An announcement of an upcoming album? Possible, but “Bad As Me” was only released in October. By Waits’ standards that would be a lightning-fast succession. Regardless…SOMETHING will be announced on Tuesday, August 7th. And any Tom Waits news is good news. So we’ll wait and see. In the meantime, what do YOU think the announcement will be? Please post any and all theories, gossip, rumors, whispers, scuttlebutt, myths, and outright lies in the comments section below. PS – Am I the only one that thinks Tom Waits needs to write a few novels before he hangs it up? (And let’s home he doesn’t hang it up anytime soon!). Can you imagine full stories devoted to the beautiful freaks that populate his songs?